In all those years roaming the sidelines in Denver, Mike Shanahan never saw one get so ugly, so fast. Not surprisingly, Peyton Manning had a hand in turning Shanahan’s homecoming sour. After being showered with applause, then staked to a two-touchdown lead, the Broncos’ old coach watched Manning and the Broncos score the last 38 points Sunday in a come-from-behind 45-21 victory over the Washington Redskins. Manning overcame four turnovers and threw for 354 yards and four touchdowns, as the Broncos came back from a 21-7 deficit early in the third quarter. Ahead by those two touchdowns after Manning threw a pick-6 to DeAngelo Hall when receiver Demaryius Thomas fell on an out route, Shanahan squinted into the sunlight, rolled-up game plan in hand, and looked at a familiar sight on the scoreboard in Denver _ his team comfortably ahead as the sun began to set over the Rockies. Manning led the Broncos (7-1) on a 75-yard scoring drive to make it 21-14, the key play coming when Knowshon Moreno ran for 5 yards on fourth-and-2 from the Washington 22. Then, after the defense forced a punt, it was Manning picking and poking again, moving Denver 83 yards in 16 plays for the tying score, a 1-yard pass to Joel Dreessen on the first play of the fourth quarter. Robert Griffin III threw three straight incompletions and Sav Rocca followed by shanking a punt 15 yards. On the next play, Manning gave Denver a 28-21 lead with a screen pass Moreno took in for a 35-yard touchdown. Von Miller ended the next drive with a sack and forced fumble to give Denver a field goal and a 10-point lead, and Washington (2-5) never got closer. The rest had all the makings of a routine runaway for the Broncos, who knocked Griffin out of the game late with an injured left knee, then got their final touchdown when Dominique Rodgers-Cromartie picked off backup Kirk Cousins and returned it 75 yards. But all the video-game numbers, including the franchise-record 31 fourth-quarter points, masked some growingly troubling problems as the Broncos reach the halfway point. 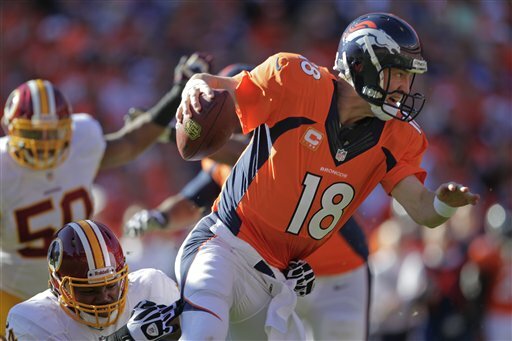 Most notably, Manning has had some issues the last three weeks. Yes, he went 30 for 44 and hit four receivers for scores, including Wes Welker, who scored for a career-high ninth time. But Manning doubled his interceptions total for the season and lost a fumble, bringing Denver’s league-leading total to 11 lost fumbles. In all, the quarterback simply didn’t look as comfortable as he did the first five weeks, before he sprained an ankle that forced him to miss his first regular-season practice as a Bronco last week. He got bailed out by the lowest-ranked pass defense, which held Griffin to a 15-for-30 day a week after he led a late winning touchdown drive in a 45-41 victory over Chicago. The Broncos forced five turnovers, including interceptions by Chris Harris, Rahim Moore and Shaun Phillips.